Landon Jefferies knew he wanted to pursue farming as a career, but the options in the city were limited. So after spending a year working farmers’ markets for The Food Trust, a Philadelphia organization that works to ensure access to affordable, nutritious food and information, and three seasons as the manager of Wyck Home Farm, a Philadelphia historic home, garden and farm, he and partner Lindsey Shapiro set about launching Root Mass Farm in rural Berks County, Pennsylvania in the summer of 2011. While Shapiro and Jefferies have learned a lot about farming over the years by trial and error, they still run into problems. And while Shapiro and Jefferies don’t have a formal farming education or background (both grew up in the suburbs), they both have a willingness to experiment. “I think that’s helped us get our footing more than anything,” says Shapiro. Currently, Root Mass Farm doesn’t bring in enough money to keep Shapiro and Jefferies employed full-time, but Shapiro is optimistic. The farmers do their best to create a vibrant farm ecosystem, and use cover crops and composted manure, as well as compost, to add fertility and organic matter to the farm’s fields. The farmers also pay close attention to the soil before doing any sort of tillage to avoid unnecessary damage and try to keep their impact low while creating a suitable environment for growing crops. Root Mass grows a little bit of everything to please its customers and to promote biodiversity on the farm. The farmers are currently farming three acres and plan to bring a fourth into cultivation next season. Currently, Root Mass sells at two Philadelphia farmers’ markets. 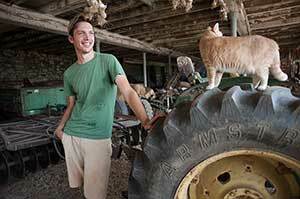 While Shapiro and Jefferies run the farm, they get part-time help from friends and family. “This season, we’re planning on bringing on some more official part-time help during the busiest months,” says Shapiro. Shapiro urges other start-up farms to start small.